As an orthodontic patient, two types of dental emergencies can affect you. These include an injury of the teeth, face or mouth and a problem with an orthodontic appliance. If you suffer a serious injury to your teeth or face, call your dentist immediately, or seek emergency dental or medical care. 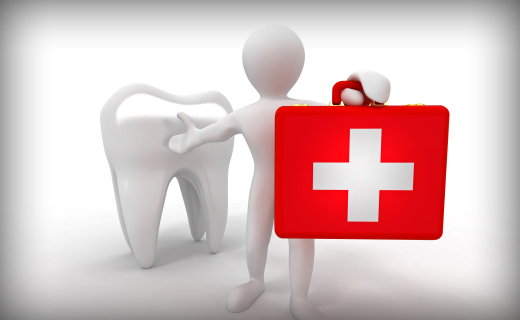 X-rays may be necessary to assess the damage and determine if the tooth can be saved. If your braces loosen or break, it’s not usually a dental emergency, but call your orthodontist as soon as possible to explain what happened and obtain advice. A broken archwire, bent headgear, or an ill-fitting removable appliance all require professional adjustment by your orthodontist. Protruding wires that poke the inside of cheeks can be trimmed. Do not attempt this on your own—call your orthodontist for advice. For managing loose brackets or bands, make an appointment with your orthodontist. If parts break off, take them with you to your appointment. To stop mouth irritation caused by brackets or wires, cover them with orthodontic wax. Should an orthodontic dental emergency occur, it’s wise to be familiar with the various parts of your appliance so you can clearly explain what happened to emergency dentists or orthodontists. A or P chain: the collection of colored elastic ligatures that connect the braces and wires. Archwires: the thin continuous wires attached to your brackets. Bands: the metal rings placed around your back teeth to anchor archwires and attach neckgear. Braces: the small brackets bonded to each of your teeth. Crowns: caps made from stainless steel that are fitted onto your molars for the Herbst orthodontic appliance. Retainers: removable devices made from plastic or acrylic and wire that help to hold your teeth in the finishing position. Permanent retainers are cemented into place. Springs: the small coils that are used to close spaces.